The Writing Assignment That Changes Lives : NPR Ed Goal-setting closed achievement gaps in a recent experiment. The key element? Students put their thoughts in writing. Why do you do what you do? What is the engine that keeps you up late at night or gets you going in the morning? Where is your happy place? What stands between you and your ultimate dream? Heavy questions. One researcher believes that writing down the answers can be decisive for students. He co-authored a paper that demonstrates a startling effect: nearly erasing the gender and ethnic minority achievement gap for 700 students over the course of two years with a short written exercise in setting goals. Jordan Peterson teaches in the department of psychology at the University of Toronto. For decades, he has been fascinated by the effects of writing on organizing thoughts and emotions. Experiments going back to the 1980s have shown that "therapeutic" or "expressive" writing can reduce depression, increase productivity and even cut down on visits to the doctor. "The act of writing is more powerful than people think," Peterson says. Most people grapple at some time or another with free-floating anxiety that saps energy and increases stress. Through written reflection, you may realize that a certain unpleasant feeling ties back to, say, a difficult interaction with your mother. That type of insight, research has shown, can help locate, ground and ultimately resolve the emotion and the associated stress. At the same time, "goal-setting theory" holds that writing down concrete, specific goals and strategies can help people overcome obstacles and achieve. Recently, researchers have been getting more and more interested in the role that mental motivation plays in academic achievement — sometimes conceptualized as "grit" or "growth mindset" or "executive functioning." Peterson wondered whether writing could be shown to affect student motivation. He created an undergraduate course called Maps of Meaning. In it, students complete a set of writing exercises that combine expressive writing with goal-setting. Students reflect on important moments in their past, identify key personal motivations and create plans for the future, including specific goals and strategies to overcome obstacles. Peterson calls the two parts "past authoring" and "future authoring." "It completely turned my life around," says Christine Brophy, who, as an undergraduate several years ago, was battling drug abuse and health problems and was on the verge of dropping out. After taking Peterson's course at the University of Toronto, she changed her major. Today she is a doctoral student and one of Peterson's main research assistants. In an early study at McGill University in Montreal, the course showed a powerful positive effect with at-risk students, reducing the dropout rate and increasing academic achievement. Peterson is seeking a larger audience for what he has dubbed "self-authoring." He started a for-profit company and is selling a version of the curriculum online. Brophy and Peterson have found a receptive audience in the Netherlands. At the Rotterdam School of Management, a shortened version of self-authoring has been mandatory for all first-year students since 2011. (These are undergraduates — they choose majors early in Europe). The latest paper, published in June, compares the performance of the first complete class of freshmen to use self-authoring with that of the three previous classes. Overall, the "self-authoring" students greatly improved the number of credits earned and their likelihood of staying in school. And after two years, ethnic and gender-group differences in performance among the students had all but disappeared. The ethnic minorities in question made up about one-fifth of the students. They are first- and second-generation immigrants from non-Western backgrounds — Africa, Asia and the Middle East. While the history and legacy of racial oppression are different from that in the United States, the Netherlands still struggles with large differences in wealth and educational attainment among majority and minority groups. At the Rotterdam school, minorities generally underperformed the majority by more than a third, earning on average eight fewer credits their first year and four fewer credits their second year. 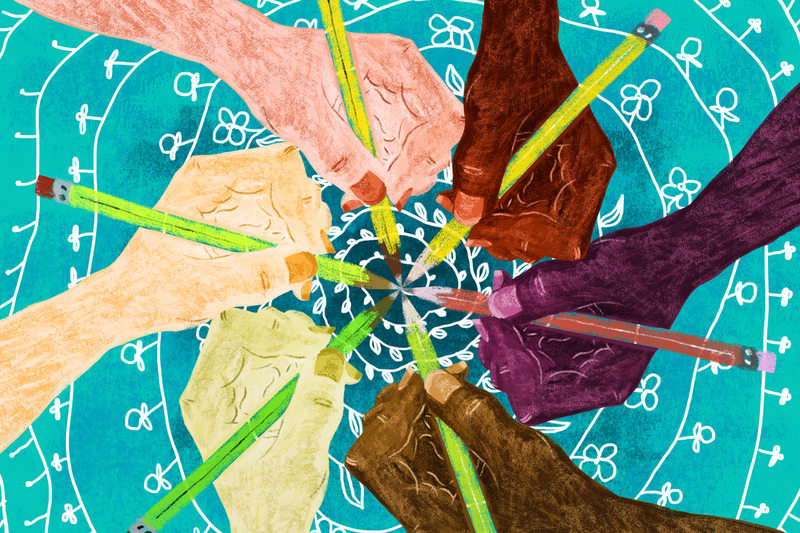 But for minority students who had done this set of writing exercises, that gap dropped to five credits the first year and to just one-fourth of one credit in the second year. How could a bunch of essays possibly have this effect on academic performance? Is this replicable? Melinda Karp is the assistant director for staff and institutional development at the Community College Research Center at Teachers College, Columbia University. She leads studies on interventions that can improve college completion. She calls Peterson's paper "intriguing." But, she adds, "I don't believe there are silver bullets for any of this in higher ed." Peterson believes that formal goal-setting can especially help minority students overcome what's often called "stereotype threat," or, in other words, to reject the damaging belief that generalizations about ethnic-group academic performance will apply to them personally. Karp agrees. "When you enter a new social role, such as entering college as a student, the expectations aren't always clear." There's a greater risk for students who may be academically underprepared or who lack role models. "Students need help not just setting vague goals but figuring out a plan to reach them." The key for this intervention came at crunch time, says Peterson. "We increased the probability that students would actually take their exams and hand in their assignments." The act of goal-setting helped them overcome obstacles when the stakes were highest. "You don't have to be a genius to get through school; you don't even have to be that interested. But zeroes are deadly." Karp has a theory for how this might be working. She says you often see at-risk students engage in self-defeating behavior "to save face." "If you aren't sure you belong in college, and you don't hand in that paper," she explains, "you can say to yourself, 'That's because I didn't do the work, not because I don't belong here.' "
Writing down their internal motivations and connecting daily efforts to blue-sky goals may have helped these young people solidify their identities as students. Brophy is testing versions of the self-authoring curriculum at two high schools in Rotterdam, and monitoring their psychological well-being, school attendance and tendency to procrastinate. Early results are promising, she says: "It helps students understand what they really want to do."